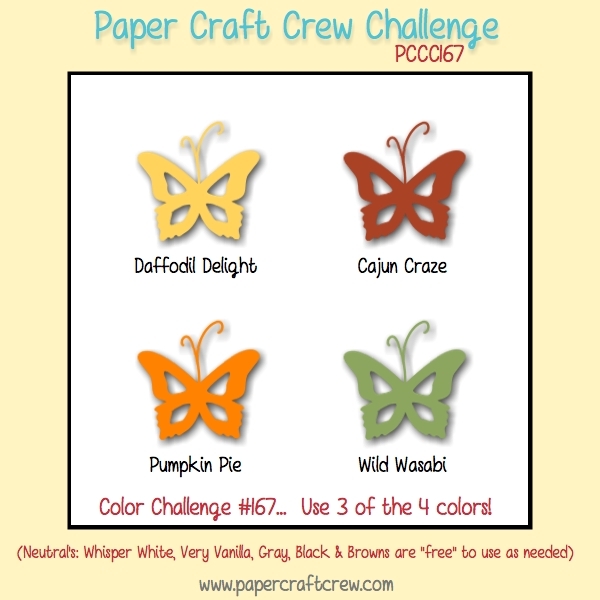 Welcome back to another weekly challenge with the Paper Craft Crew! I like to hang a wreath on my front door, and sometimes on the inside of the kitchen door, so that’s how I thought of this. I created the ‘door’ by stamping a piece of 4″ x 5 1/4″ Crumb Cake cardstock with the Hardwood background stamp, in Crumb Cake ink. I then stamped another piece the same, then used my Stampin’ Trimmer to cut the ‘panels’; the 2 top sections are each 1 1/2″ x 1 1/2″, and the 2 bottom panels are each 1 1/2″ x 2 1/2″. I used a Sponge Dauber and Crumb Cake ink to sponge around the edges of all of the panels, as well as the ‘door’. I used the Wondrous Wreath stamp set, and stamped the bottom leaves in Pumpkin Pie ink. The next layer of leaves are in Cajun Craze ink. I then stamped the ribbon and bow in both Daffodil Delight and Cajun Craze, then die cut all the pieces using the Big Shot and the Wonderful Wreath Framelits dies. I also used this die set to cut out the ‘Joy’ in both Cajun Craze and Daffodil Delight cardstock. 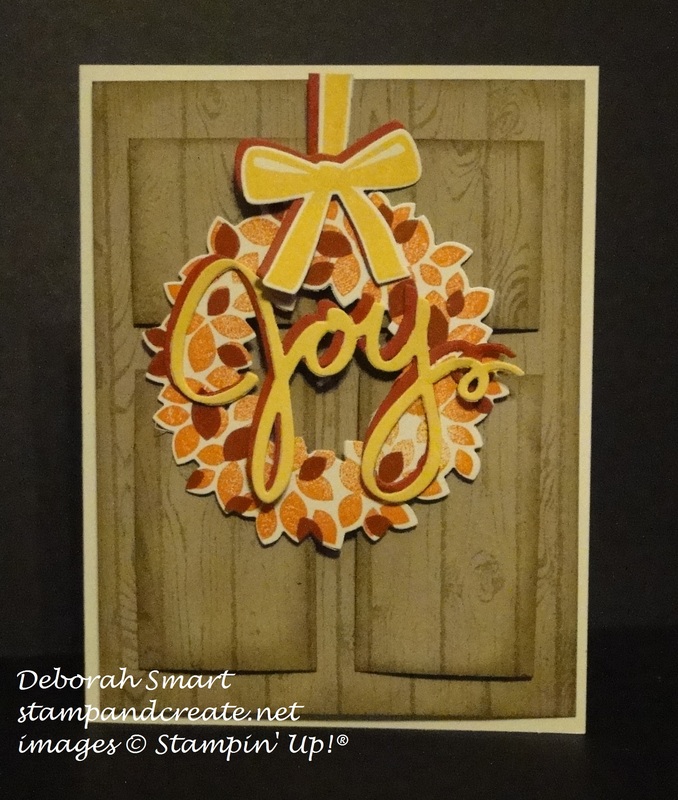 I then layered all of the pieces on top of the door; for effect, I offset the 2 colours of the ‘joy’ and the ribbon/bow, using the new Thin Tipped Glue Pen. The door was then layered onto the card base of Very Vanilla cardstock. That was it – a nice, quick card that has a bit of ‘punch’ with the extra layers and dimensions. Now I hope you’ll head over to the Paper Craft Crew page, and see what the rest of the design team has created for your inspiration! Then I hope you’ll be inspired to join us in this challenge – you just may be one of the next design team top picks!